Can Anyone Better the John Lewis Advert? It’s that time of year again when, as soon as the embers die down on the bonfires, the Christmas TV ads appear. As video marketing goes, this is like the World Cup and the Superbowl rolled into one. The all-conquering titan amongst the festive commercials is John Lewis, who have created a whole new phenomenon in recent years with their whimsical renditions of classic tunes played out over heartwarming visuals. But does the department store’s most recent effort trounce the other Christmas TV ads of 2018? Here’s a rundown of what to expect. Following on from 2017’s Moz, the imaginary monster under a young boy’s bed, and Monty the lovelorn penguin in 2014, the 2018 John Lewis Christmas advert features another flamboyant and fantastical character – Elton John. The 71-year-old rocker performs his 1970 hit Your Song as the advert takes the viewer on a journey back through his life, ending up with a schoolboy Reg Dwight receiving his mother’s piano as a festive gift. The idea is that presents aren’t just throwaway items, they can be the spark behind igniting a passion; in this case, instigating a multimillion-record-selling pop career. However, millions of parents the world over whose children receive noisy instruments from relatives this Christmas may struggle to remain optimistic about that. It’s a neat idea that is stunningly realised, interweaving old footage and recreated scenes in a slick and high quality piece of video marketing. The use of Your Song is a neat callback to the Ellie Goulding’s version of the tune, which soundtracked the store’s 2010 Yuletide campaign. A large number of viewers felt it was more an advert for Elton John than for John Lewis. Indeed, if the rumours are true that Elton was paid £5 million to appear, his agent deserves a payrise. It came out just months before the release of the pop star’s biopic Rocketman, and on the day that tickets went on sale for his final ever tour. It certainly seems that the department store has paid Elton John a seven-figure sum to allow him to promote his own product! Genius. Talking of genius marketing, Iceland caught the initial attention of the press this autumn. Their animated advert warning of rainforest destruction caused by the intensive farming of palm oil wasn’t allowed to be shown on TV because it was made by a political organisation, Greenpeace. Of course, this being the age of social media, the video featuring a cute orangutan and a moving poem read by Emma Thompson has gone viral and been seen by potentially many more people than would have caught it on the telly. The clip talks of the threat to the great ape’s existence and sets out Iceland’s promise to remove palm oil from its own-brand products until the harvesting of it no longer harms the rainforest. It’s a perfect storm; a company setting out its social conscience, a heart-wrenching storyline and the controversy of the ban. However, there is some debate over whether it actually was banned or whether they were simply advised that it might be. It’s also suggested that the advert was made in order to be banned, knowing what the result would be. It has certainly fueled the popularity of the video. Raising awareness of a serious issue and your own brand at the same time is surely the holy grail of video marketing. 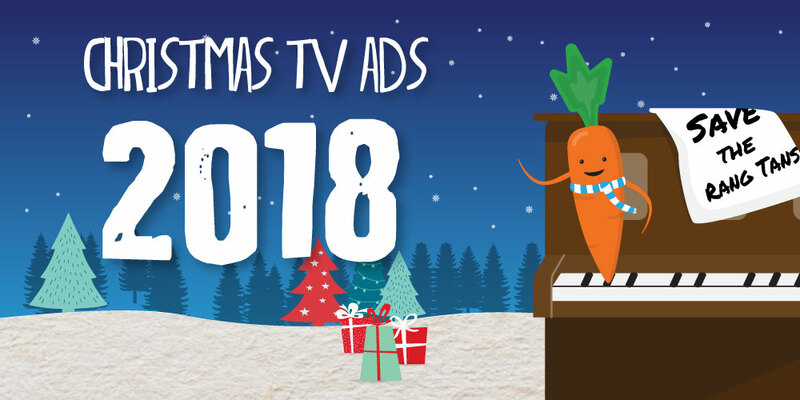 German supermarket chain Aldi welcome back Kevin the Carrot for a much more lighthearted affair than some of the other Christmas TV ads on the scene. The animated veg fends off an evil parsnip in one commercial and spins a Coca Cola style lorry off a mountain road in an Italian Job style in another. M&S concentrate on the ‘new traditions’ of Christmas in their Holly Willoughby-fronted campaign. Apparently we all sing along to Bridget Jones nowadays. This is pretty simplistic fare. Supermarket chain Sainsbury’s have enlisted the director of The Greatest Showman Michael Gracey to look after their Christmas ad campaign for 2018. It’s set in a school play where a nervous girl dressed as a star begins singing You Only Get What You Give by the New Radicals. As she grows in confidence, her classmates invade the stage dressed as all kinds of Christmas motifs. There is a Queen in a cardboard TV, a set of baubles and even a child dressed as a plug, jumping into a socket to power up the lights connected to him. This could be an outsider for Christmas TV ad of the year once the last of the leftover turkey has been forced down.